The world as we know it today, civilization as we know it today (because, for us, civilization is the world, our world, the world we have constructed for ourselves), is the result of three revolutions. What was civilization like before these revolutions? Humanity began with the development of an agricultural or pastoral economy subsequently given ritual expression in a religious central project that defined independently emergent civilizations. Though widely scattered across the planet, these early agricultural civilizations had important features in common, with most of the pristine civilizations beginning to emerge shortly after the Holocene warming period of the current Quaternary glaciation. Although independently originating, these early civilizations had much in common — arguably, each had more in common with the others emergent about the same time than they have in common with contemporary industrialized civilization. How, then, did this very different industrialized civilization emerge from its agricultural civilization precursors? This was the function of the three revolutions: to revolutionize the conceptual framework, the political framework, and the economic framework from its previous traditional form into a changed modern form. The institutions bequeathed to us by our agricultural past (the era of exclusively biocentric civilization) were either utterly destroyed and replaced with de novo institutions, or traditional institutions were transformed beyond recognition to serve the needs of a changed human world. There are, of course, subtle survivals from the ten thousand years of agricultural civilization, and historians love to point out some of the quirky traditions we continue to follow, though they make no sense in a modern context. But this is peripheral to the bulk of contemporary civilization, which is organized by the institutions changed or created by the three revolutions. Copernicus stands at the beginning of the scientific revolution, and he stands virtually alone. The scientific revolution begins as the earliest of the three revolutions, in the early modern period, and more specifically with Copernicus in the sixteenth century. The work of Copernicus was elaborated and built upon by Kepler, Galileo, Huygens, and a growing number of scientists in western Europe, who began with physics, astronomy, and cosmology, but, in framing a scientific method applicable to the pursuit of knowledge in any field of inquiry, created an epistemic tool that would be universally applied. The application of the scientific method had the de facto consequence of stigmatizing pre-modern knowledge as superstition, and the attitude emerged that it was necessary to extirpate the superstitions of the past in order to build anew on solid foundations of the new epistemic order of science. This was perceived as an attack on traditional institutions, especially traditional cultural and social institutions. It was this process of the clearing away of old knowledge, dismissed as irrational superstition, and replacing it with new scientific knowledge, that gave us the conflict between science and religion that still simmers in contemporary civilization. Democracy in its modern form dates from 1776 and is therefore a comparatively young historical institution. The political revolutions that began in the last quarter of the eighteenth century, beginning with the American Revolution in 1776, followed by the French Revolution in 1789, and then a series of revolutions across South America that displaced Spain and the Spanish Empire from the continent and the western hemisphere (in a kind of revolutionary contagion), ushered in an age of representative government and popular sovereignty that remains the dominant paradigm of political organization today. The consequences of these political revolutions have been raised to the status of a dogma, so that it no longer considered socially acceptable to propose forms of government not based upon representative institutions and popular sovereignty, however dismally or frequently these institutions disappoint. We are all aware of the experiment with democracy in classical antiquity in Athens, and spread (sometimes by force) by the Delian League under Athenian leadership until the defeat of Athens by the Spartans and their allies. The ancient experiment with democracy ended with the Peloponnesian War, but there were quasi-democratic institutions throughout the history of western civilization that fell short of perfectly representative institutions, and which especially fell short of the ideal of popular sovereignty implemented as universal franchise. Aristotle, after the Peloponnesian War, had already converged on the idea of a mixed constitution (a constitution neither purely aristocratic nor purely democratic) and the Roman political system over time incorporated institutions of popular participation, such as the Tribune of the People (Tribunus plebis). Medieval Europe, which Kenneth Clark once called a, “conveniently loose political organization,” frequently involved self-determination through the devolution of political institutions to local control, which meant that free cities might be run in an essentially democratic way, even if there were no elections in the contemporary sense. Also, medieval Europe dispensed with slavery, which had been nearly universal in the ancient world, and in so doing was responsible for one of the great moral revolutions of human civilization. The political revolutions that broke over Europe and the Americas with such force starting in the late eighteenth century, then, had had the way prepared for them by literally thousands of years of western political philosophy, which frequently formulated social ideals long before there was any possibility of putting them into practice. Like the scientific revolution, the political revolutions had deep roots in history, so that we should rightly see them as the inflection points of processes long operating in history, but almost imperceptible in their earliest expression. Early industrialization often had an incongruous if not surreal character, as in this painting of traditional houses silhouetted again the Madeley Wood Furnaces at Coalbrookdale. The industrial revolution began in England with the invention of James Watt’s steam engine, which was, in turn, an improvement upon the Newcomen atmospheric engine, which in turn built upon a long history of an improving industrial technology and industrial infrastructure such as was recorded in Adam Smith’s famous example of a pin factory, and which might be traced back in time to the British Agricultural Revolution, if not before. The industrial revolution rapidly crossed the English channel and was as successful in transforming the continent as it had transformed England. The Germans especially understood that it was the scientific method as applied to industry that drove the industrial revolution forward, as it still does today. It is science rather than the steam engine that truly drove the industrial revolution. As the scientific revolution drove epistemic reorganization and the political revolutions drove sociopolitical reorganization, the industrial revolution drove economic reorganization. Today, we are all living with the consequences of that reorganization, with more human beings than ever before (both in terms of absolute numbers and in terms of rates) living in cities, earning a living through employment (whether compensated by wages or salary is indifferent; the invariant today is that of being an employee), and organizing our personal time on the basis of clock times that have little to do with the sun and the moon, and schedules that have little or no relationship to the agricultural calendar. Terrestrial civilization as we know it today is the product of these three revolutions, but must these three revolutions occur, and must they occur in this specific order, for any civilization whatever that would constitute a peer technological civilization with which we might hope to engage in communication? That is to say, if there are other civilizations in the universe (or even in a counterfactual alternative history for terrestrial civilization), would they have to arrive at radio telescopes and spacecraft by this same sequence of revolutions in the same order, or would some other sequence (or some other revolutions) be equally productive of technological civilizations? This may well sound like a strange question, perhaps an arbitrary question, but this is the sort of question that formal historiography asks. In several posts I have started to outline a conception of formal historiography in which our interest is not only in what has happened on Earth, or what might yet happen on Earth, but what can happen with any civilization whatsoever, whether on Earth or elsewhere (cf. Big History and Scientific Historiography, History in an Extended Sense, Rational Reconstructions of Time, An Alternative Formulation of Rational Reconstructions of Time, and Placeholders for Null-Valued Time). While this conception is not formulated for the express purpose of investigating questions like the Fermi paradox, I hope that the reader can see how such an investigation bears upon the Fermi paradox, the Drake equation, and other “big picture” conceptions that force us to think not in terms of terrestrial civilization, but rather in terms of any civilization whatever. From a purely formal conception of social institutions, it could be argued that something like these revolutions would have to take place in something like the terrestrial order. The epistemic reorganization of society made it possible to think scientifically about politics, and thus to examine traditional political institutions rationally in a spirit of inquiry characteristic of the Enlightenment. Even if these early forays into political science fall short of contemporary standards of rigor in political science, traditional ideas like the divine right of kings appeared transparently as little better than political superstitions and were dismissed as such. The social reorganization following from the rational examination the political institutions utterly transformed the context in which industrial innovations occurred. If the steam engine or the power loom had been introduced in a time of rigid feudal institutions, no one would have known what to do with them. Consumer goods were not a function of production or general prosperity (as today), but rather were controlled by sumptuary laws, much as the right to engage in certain forms of commerce was granted as a royal favor. These feudal political institutions would not likely have presided over an industrial revolution, but once these institutions were either reformed or eliminated, the seeds of the industrial revolution could take root. In this interpretation, the epistemic reorganization of the scientific revolution, the social reorganization of the political revolutions, and the economic reorganization of the industrial revolution are all tightly-coupled both synchronically (in terms of the structure of society) and diachronically (in terms of the historical succession of this sequence of events). I am, however, suspicious of this argument because of its implicit anthropocentrism as well as its teleological character. Rather than seeking to justify or to confirm the world we know, framing the historical problem in this formal way gives us a method for seeking variations on the theme of civilization as we know it; alternative sequences could be the basis of thought experiments that would point to different kinds of civilization. Even if we don’t insist that this sequence of revolutions is necessary in order to develop a technological civilization, we can see how each development fed into subsequent developments, acting as a social equivalent of directional selection. If the sequence were different, presumably the directional selection would be different, and the development of civilization taken in a different direction. I will not here attempt a detailed analysis of the permutations of sequences laid out in the graphic above, though the reader may wish to think through some of the implications of civilizations differently structured by different revolutions at different times in their respective development. For example, many science fiction stories imagine technological civilizations with feudal institutions, whether these feudal institutions are retained unchanged from a distant agricultural past, or whether they were restored after some kind of political revolution analogous to those of terrestrial history, so one could say that, prima facie, political revolution might be entirely left out, i.e., that political reorganization is dispensable in the development of technological civilization. I would not myself make this argument, but I can see that the argument can be made. Such arguments could be the basis of thought experiments that would present civilization-as-we-do-not-know-it, but which nevertheless inhabit the same parameter space of civilization-as-we-know-it. William of Ockham, one of the greatest philosophers of the late Middle Ages, is remembered today primarily for his formulation of the principle of parsimony, also called Ockham’s razor. In the discussion surrounding the unusual light curve of the star KIC 8462852, Ockham’s razor has been mentioned numerous times. I have written a couple of posts on this topic, i.e., interpreting the light curve of KIC 8462852 in light of Ockham’s razor, KIC 8462852 and Parsimony and Plenitude in Cosmology. “…aliens are always the last hypothesis you should consider. Occam’s razor tells scientists to always go for the simplest explanation for a new phenomenon. But even as we keep Mr. Occam’s razor in mind, there is something fundamentally new happening right now that all of us, including scientists, must begin considering… the exoplanet revolution means we’re developing capacities to stare deep into the light produced by hundreds of thousands of boring, ordinary stars. And these are exactly the kind of stars where life might form on orbiting planets… So we are already going to be looking at a lot of stars to hunt for planets. And when we find those planets, we are going to look at them for basic signs that life has formed. But all that effort means we will also be looking in exactly the right places to stumble on evidence of not just life but intelligent, technology-deploying life. In a recent post, Parsimony and Emergent Complexity I went a bit further and suggested that Ockham’s razor can be formulated with greater precision in terms of emergent complexity, such that no phenomenon should be explained in terms of a level of emergent complexity higher than that necessary to explain the phenomenon. Like Darwin many centuries later, Copernicus hesitated to publish his big book to explain his big idea, i.e., heliocentrism. Both men, Darwin and Copernicus, understood the impact that their ideas would have, though both probably underestimated the eventual influence of these ideas; both were to transform the world and leave as a legacy entire cosmologies. The particular details of the Copernican system are less significant than the Copernican idea, i.e., the Copernican cosmology, which, like Ockham’s razor, has gone on to a long career of continuing influence. Darwin eventually published in his lifetime, prompted by the “Ternate essay” that Wallace sent him, but Copernicus put off publishing until the end of his life. It is said that Copernicus was shown a copy of the first edition of De revolutionibus on his deathbed (though this is probably apocryphal). Copernicus, of course, lived much closer to the medieval world than did Darwin — one could well argue that Toruń and Frombork in the fifteenth and sixteenth centuries was the medieval world — so we can readily understand Copernicus’ hesitation to publish. Darwin published in a world already transformed by industrialization, already wrenched by unprecedented social change; Copernicus eventually published in a world that, while on the brink of profound change, had not appreciably changed in a thousand years. Copernicus’ hesitation meant that he did not directly supervise the publication of his manuscript, that he was not able to correct or revise subsequent editions (Darwin revised On the Origin of Species repeatedly for six distinct editions in his lifetime, not including translations), and that he was not able to respond to the reception of his book. All of these conditions were to prove significant in the reception and propagation of the Copernican heliocentric cosmology. Copernicus, after long hesitation, was stimulated to pursue the publication of De revolutionibus by his contact with Georg Joachim Rheticus, who traveled to Frombork for the purpose of meeting Copernicus. Rheticus, who had great respect for Copernicus’ achievement, came from the hotbed of renaissance and Protestant scholarship that was Nuremberg. He took Copernicus’ manuscript to Nuremberg to be published by a noted scientific publisher of the day, but Rheticus did not stay to oversee the entire publication of the work. This job was handed down to Andreas Osiander, a Protestant theologian who sought to water down the potential impact of De Revolutionibus by adding a preface that suggested that Copernicus’ theory should be accepted in the spirit of an hypothesis employed for the convenience of calculation. Osiander did not sign this preface, and many readers of the book, when it eventually came out, thought that this preface was the authentic Copernican interpretation of the text. Osiander’s preface, and Osiander’s intentions in writing the preface (and changing the title of the book) continue to be debated to the present day. This debate cannot be cleanly separated from the tumult surrounding the Protestant Reformation. Luther and the Lutherans were critical of Copernicus — they had staked the legitimacy of their movement on Biblical literalism — but one would have thought that Protestantism would have been friendly to the work of Ockham, given Ockham’s conflict with the Papacy, Ockham’s fideism, and his implicit position as a critic of Thomism. (I had intended to read up on the Protestant interpretation of Ockham prior to writing this post, but I haven’t yet gotten to this.) The parsimony of Copernicus’ formulation of cosmology, then, was a mixed message to the early scientific revolution in the context of the Protestant Reformation. Both Rheticus and Copernicus’ friend Tiedemann Giese were indignant over the unsigned and unauthorized preface by Osiander. Rheticus, by some accounts, was furious, and felt that the book and Copernicus had been betrayed. He pursued legal action against the printer, but it is not clear that it was the printer who was at fault for the preface. While Rheticus suspected Osiander as the author of the preface, this was not confirmed until some time later, when Rheticus had moved on to other matters, so Osiander was never pursued legally over the preface. The most common reason adduced to preferring Copernican cosmology to Ptolematic cosmology is not that one is true and the other is false (though this certainly is a reason to prefer Copernicus) but rather that the Copernican cosmology is the simpler and more straight-forward explanation for the observed movements of the stars and the planets. The Ptolemaic system can predict the movements of stars, planets, and the moon (within errors of margin relevant to its time), but it does so by way of a much more complex and cumbersome method than that of Copernicus. Copernicus was radical in the disestablishment of traditional cosmological thought, but once beyond that first radical step of displacing the Earth of the center of the universe (a process we continue to iterate today), the solar system fell into place according to a marvelously simple plan that anyone could understand once it was explained: the sun at the center, and all the planets revolving around it. From the perspective of our rotating and orbiting Earth, the other planets also orbiting the sun appear to reverse in their course, but this is a mere artifact due to our position as observers. Once Copernicus can convince the reader that, despite the apparent solidity of the Earth, it is in fact moving through space, everything else falls into place. The knowledge that we have of our solar system, and indeed of the universe entire, is derived from observations and deduction from observations. Moreover, seeing the truth of Copernican heliocentrism would not only require an overview in space, but an overview in time, i.e., one would need to hover over our solar system for hundreds of years to see all the planets rotating around the common center of the sun, and one would have to, all the while, remain focused on observing the solar system in order to be able to have “seen” the entire process — a feat beyond the limitations of the human lifetime, not to mention human consciousness. Copernicus himself did not mention the principle of parsimony or Ockham’s razor, and certainly did not mention William of Ockham, though Ockham was widely read in Copernicus’ time. The principle of parsimony is implicit, even pervasive, in Copernicus, as it is in all good science. We don’t want to account for the universe with Rube Goldberg-like contraptions as our explanations. In a much later era of scientific thought — in the scientific thought of our own time — Stephen J. Gould wrote an essay titled “Is uniformitarianism necessary?” in which he argued for the view that uniformitarianism in geology had simply come to mean that geology follows the scientific method. Similarly, one might well argued that parsimony is no more necessary than uniformitarianism, and that what content of parsimony remains is simply coextenisve with the scientific method. To practice science is to reason in accordance with Ockham’s razor, but we need not explicitly invoke or apply Ockham’s razor, because its prescriptions are assimilated into the scientific method. And indeed this idea fits in quite well with the casual references to Ockham’s razor such as that I quoted above. Most scientists do not need to think long and hard about parsimony, because parsimonious formulations are already a feature of the scientific method. If you follow the scientific method, you will practice parsimony as a matter of course. Copernicus’ Ockham, then, was already the Ockham already absorbed into nascent scientific thought. Perhaps it would be better to say that parsimony is implicit in the scientific method, and Copernicus, in implicitly following a scientific method that had not yet, in his time, been made explicit, was following the internal logic of the scientific method and its parsimonious demands for simplicity. Andreas Osiander (19 December 1498 – 17 October 1552) was a German Lutheran theologian who oversaw the publication of Copernicus’ De revolutionibus and added an unsigned preface that many attributed to Copernicus. Osiander was bitterly criticized in his own time for his unauthorized preface to Copernicus, though many immediately recognized it as a gambit to allow for the reception of Copernicus’ work to involve the least amount of controversy. As I noted above, the Protestant Reformation was in full swing, and the events that would lead up the Thirty Years’ War were beginning to unfold. Europe was a powder keg, and many felt that it was the better part of valor not to touch a match to any issue that might explode. All the while, others were doing everything in their power to provoke a conflict that would settle matters once and for all. Osiander not only added the unsigned and unauthorized preface, but also changed the title of the whole work from De revolutionibus to De revolutionibus orbium coelestium, adding a reference to the heavenly spheres that was not in Copernicus. This, too, can be understood as a concession to the intellectually conservative establishment — or it can be seen as a capitulation. But it was the preface, and what the preface claimed as the proper way to understand the work, that was the nub of the complaint against Osiander. If we eliminate the final qualification, “unless it has been divinely revealed to him,” Osiander’s preface is a straight-forward argument for instrumentalism. Osiander recommends Copernicus’ work because it gives the right results; we can stop there, and need not make any metaphysical claims on behalf of the theory. This ought to sound very familiar to the modern reader, because this kind of instrumentalism has been common in positivist thought, and especially so since the advent of quantum theory. Quantum theory is the most thoroughly confirmed theory in the history of science, confirmed to a degree of precision almost beyond comprehension. And yet quantum theory still lacks an intuitive correlate. Thus we use quantum theory because it gives us the right results, but many scientists hesitate to give any metaphysical interpretation to the theory. Copernicus, and those most convinced of his theory, like Rheticus, was a staunch scientific realist. He did not propose his cosmology as a mere system of calculation, but insisted that his theory was the true theory describing the motions of the planets around the sun. It follows from this uncompromising scientific realism that other theories are not merely less precise in calculating the movements of the planets, but false. Scientific realism accords with common sense realism when it comes to the idea that there is a correct account of the world, and other accounts that deviate from the correct account are false. But we all know that scientific theories are underdetermined by the evidence. To formulate a law is to go beyond the finite evidence and to be able to predict an infinitude of possible future states of the phenomenon predicted. Scientific realism, then, is an ontologically robust position, and this ontological robustness is a function of the underdetermination of the theory by the evidence. Osiander argues of Copernicus’ theory that, “if they provide a calculus consistent with the observations, that alone is enough.” So Osiander is not willing to go beyond the evidence and posit the truth of an underdetermined theory. Moreover, Osiander was willing to maintain empirically equivalent theories, “since different hypotheses are sometimes offered for one and the same motion.” Given empirically equivalent theories that can both “provide a calculus consistent with the observations,” why would one theory be favored over another? Osiander states that the astronomer will prefer the simplest explanation (hence explaining Copernicus’ position) while the philosopher will seek a semblance of truth. Neither, however, can know what this truth is without divine revelation. Osiander’s Ockham is the convenience of the astronomer to seek the simplest explanation for his calculations; the astronomer is justified in employing the simplest explanation of the most precise method available to calculate and predict the course of the heavens, but he cannot know the truth of his theory unless that truth is guaranteed by some outside and transcendent evidence not available through science — a deus ex machina for the mind. Copernicus’ Ockham was ontological parsimony; Osiander’s Ockham was methodological parsimony. Are we forced to choose between the two, or are we forced to find a balance between ontological and methodological parsimony? These are still living questions in the philosophy of science today, and there is a sense in which it is astonishing that they appeared so early in the scientific revolution. As noted above, the world of Copernicus was essentially a medieval world. Toruń and Frombork were far from the medieval centers of learning in Paris and Oxford, and about as far from the renaissance centers of learning in Florence and Nuremberg. Nevertheless, the new cosmology that emerged from the scientific revolution, and which is still our cosmology today, continuously revised and improved, can be traced to the Baltic coast of Poland in the late fifteenth and early sixteenth century. The controversy over how to interpret the findings of science can be traced to the same root. The conventions of the scientific method were established in the work of Copernicus, Galileo, and Newton, which means that it was the work of these seminal thinkers who established these conventions. Like the cosmologies of Copernicus, Galileo, and Newton, the scientific method has also been continuously revised and improved. That Copernicus grasped in essence as much of the scientific method as he did, working in near isolation far from intellectual centers of western civilization, demonstrates both the power of Copernicus’ mind and the power of the scientific method itself. As implied above, once grasped, the scientific method has an internal logic of its own that directs the development of scientific thought. The scientific method — methodological naturalism — exists in an uneasy partnership with scientific realism — ontological naturalism. We can see that this tension was present right from the very beginning of the scientific revolution, before the scientific method was ever formulated, and the tension continues down to the present day. Contemporary analytical philosophers discuss the questions of scientific realism in highly technical terms, but it is still the same debate that began with Copernicus, Rheticus, and Osiander. Perhaps we can count the tension between methodological naturalism and ontological naturalism as one of the fundamental tensions of scientific civilization. This post began as a single sentence in one of my note books, and continued to grow as I worked on it. As soon as I posted it I realized that the discussions of scientific realism, instrumentalism, and methodological naturalism in relation to parsimony could be much better. With additional historical and philosophical discussion, this post might well be transformed into an entire book. So for the questioning reader, yes, I understand the inadequacy of what I have written above, and that I have not done justice to my topic. Shortly after posting the above Paul Carr pointed out to me that the joint ESA-NASA Ulysses deep-space mission sent a spacecraft to study the poles of the sun, so we have sent a spacecraft out of the plane of the solar system, which could “look down” on our star and its planetary system, although the mission was not designed for this and had no cameras on board. If we did position a camera “above” our solar system, it would be able to take pictures of our heliocentric solar system. This, however, would be more indirect evidence — more direct than deductions from observations, but not as direct as seeing this with one’s own eyes — like the famous picture of the “blue marble” Earth, which is an overview experience for those of us who have not been into orbit to the moon, but which is not quite the same as going into orbit or to the moon. Paul Carr also drew my attention to Astronomy Cast Episode 390: Occam’s Razor and the Problem with Probabilities, with Fraser Cain and Pamela Gay, which discusses Ockham’s razor in relation to positing aliens as a scientific explanation. Yesterday I drove all day long from Portland to San Rafael, California, to attend the second IBHA conference, “Teaching and Researching Big History: Big Picture, Big Questions,” being held at the Dominican University of California. IBHA stands for “International Big History Association,” while “big history” is a contemporary approach to historiography that emphasizes telling the whole story of history from the big bang to the present day, and unifies scientific and humanistic approaches to history. Several of the leading figures in the field of big history are present, and many of them have spoken of how they came to the idea of big history, and that they were essentially doing big history long before there was a name for it. I can identify with this, as I was myself groping toward something like big history, which I am one time called integral history. The conference began with a plenary session featuring David Christian who spoke on “Big History: A Personal Voyage.” David Christian is the most visible face in big history. He began by posing the question, “How do you segue from the smallest scales to the largest scales?” and he gave the first suggestion of an answer by using Van Gogh’s painting “Starry Night over the Rhone” (reproduced above) to show the unity of the eight levels of emergent complexity identified by big historians, from the stars in the sky to the two human figures in the foreground. Christian said that he had been encouraged to give a personal view of his journey to big history, and he said that for him it began with an initial disillusionment, when he began school with great enthusiasm, thinking that this would be a place where big questions could be welcomed, and quickly found out that this was not the case. Big history, he said, gives us a framework in which to meaningfully ask big questions. Christian also said that “mapping is meaning” — and by “mapping” he not only means conventional maps, but also “maps of time,” which is the title of one of his books. If it is true that mapping is meaning, this implies that the lack of a map is the lack of meaning. We lack maps of time, hence the meaning we crave. We all know that meaninglessness has been a touchstone of modernity. It was a central theme of existentialism, and Christian referred to Durkheim’s use of “anomie” (from the Greek a-nomos, the negation of law). Christian pointed out that there are two responses to anomie: the conventional response that anomie is part of modernity, so accept it for what it is, and the big history response, which is that we are in the midst of constructing a new conception of the world, so our disorientation is understandable, but will not necessarily be a permanent feature of the human condition from now on. Christian spoke for more than an hour, so there was a lot to take in, and I can’t even give a sketch of the whole presentation here. It was videotaped, so perhaps by the time you read this it will be available online. I especially like that fact that Christian referred to himself as a “framework thinker.” This strikes me as particularly apt, and I think that all big thinkers who like to try to see the big picture (and hence are attracted to big history) are framework thinkers. The second speaker to the plenary session was Robert Conner, a likeable classicist who covered a lot of ground in his talk. Being a classicist, he formulated his perspective in terms of the Greeks, but the principles were in no sense parochial to the west’s classical antiquity. Conner was especially concerned with the difference between those who see education as a matter of acquiring habits of mind, and those who see education as primarily as the communication of a particular story. That is to say, he contrasted history — and, by implication, big history — as an analytical inquiry and as preserving the memory of the past. Conner developed this theme (by way of a detour through Herodotus and Thucydides) toward the idea of learning and education appropriate to a free people. He framed this in terms of “putting questions to the past that will be useful to us now.” I was a bit surprised after this that he did not mention Nietzsche’s essay “The Advantages and Disadvantages of History for Life,” since this covers almost exactly the same ground. It would also have been relevant to bring up T. S. Eliot’s “Tradition and the Individual Talent” in this context, just substituting this historical tradition (largely humanistic, rather than scientific) for the literary and poetic tradition that interested Eliot. David LePoire discussing energy flows. After the plenary session the conference broke up into five rooms with presentations going on concurrently (which ensures that attendees will miss a large part of the program because you can’t be in two different rooms at once, though you can move, which is disruptive). I chose to go to the room with the theme of complexity, featuring presentations by David LePoire, David Baker, and J. Daniel May. David LePoire spoke on “Two Contrasting Views of Energy and Time Scales,” in which he discussed (among other topics) how higher energy flows into systems can force a reorganization of these energy flows by way of a bifurcation. I’m not at all sure that I understood LePoire (though I picked up a list of his papers so that I can review them at some later date) but I took this to mean that a system that has been stable may become unstable when too much energy begins to flow through it, and it this point is bifurcates into two systems, at least one of which is at a higher level of emergent complexity that is able to remain stable and to thrive at these higher energy levels. If this is what LePoire meant, it seems perfectly sensible to me, and all the discussion (see below) about civilization and energy levels then suggests that once we pump too much energy through civilization, civilization will bifurcate, perhaps producing what I have elsewhere called a post-civilizational institution that can presumably remain stable at these higher energy levels. 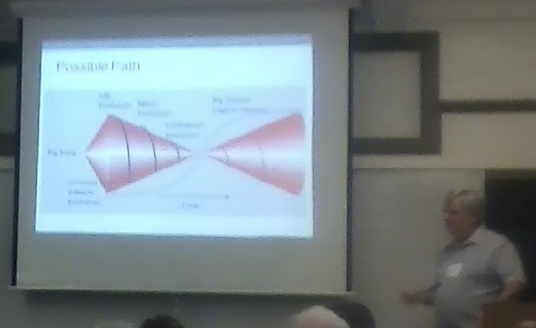 David Baker spoke on “The Darwinian Algorithm: An Extension of Rising Complexity as a Unifying Theme of Big History” which was concerned with universal Darwinism, which I take to be equivalent to what is elsewhere called universal selection theory. The influence of Eric Chaisson was apparent again here — Chaisson’s name comes up repeatedly, and many expressed disappointment that he is not at this conference — as Baker described how he used Chaisson’s free energy rate density to formulate universal Darwinism in a big history context. There was a lot of discussion about this after the talk, but what was most interesting to me was that that Baker formulated Chaisson’s ideas on energy flows in the language of Kardashev, though without mentioning Kardashev by name. Paraphrasing from memory, he said that a Type I civilization would utilize energy flows of an entire planet, a Type II civilization would utilize the energy flows of an entire star, and a Type III civilization would utilize the energy flows of an entire galaxy. As I have a particular interest in collecting variations on the theme of Kardashev’s civilization types, I was particularly interested to hear this substitution of “energy flows” for the quantitative approach that Kardashev took to civilization and energy. Indeed, I have now come to realize that Kardashev’s civilization types may be considered an early, non-constructive approach to civilization’s use of energy, whereas the big history approaches now being pursued in the shadow of Chaisson may be thought of as constructive expressions of the same essential idea. J. Daniel May, not in the printed program, spoke on “Complexity by the Numbers.” May is an instructor in big history at the Dominican University (which has a required course on big history for all students), and he was concerned with the practical pedagogical problem of getting students to understand the unifying theme of emergent complexity, and to this end he had been collecting clear examples of qualitative change linked to the quantitative change of a single metric. I thought that this was a very effective approach. He cited examples such as the decrease of the temperature of the early universe and the emergence of matter, the mass of a proto-stellar nebula and the kind of star that forms from them, and the direct and familiar relationship between number of protons in the nucleus of an atom and the different properties of different elements. Closely related to the problem of emergent complexity is the problem of thresholds in big history. This session was supposed to consist of three speakers, one by Skype from Moscow, but the Skype connection didn’t work out, so there were two presentations, “An Alternative scheme of Thresholds and historical turning points” by William McGaughey and “Using Marshall Hodgson’s Concept of Transmutations to Advance our Understanding of Thresholds in the Human Historical Experience” by John Mears. Because the third speaker could not be connected via Skype, the two presentations were followed by an extended question and answer session that was both interesting and enlightening. John Mears raised a number of traditional historiographical problems in a big history context, especially concerning what he called, “the unavoidable problem of periodization” and “the inherent pitfalls of periodization.” I can sympathize with this, as I have struggled with periodization myself. Mears mentioned some of his minor differences over periodization with other big historians — he cited a particular example from the new big history textbook, which did not include Chaisson’s transition from the “energy era” of the universe to the “matter era” — but acknowledged in a very open way that there are many possible approaches to big history periodization. This fit in well with with William McGaughey’s presentation, which was concerned to describe a periodization that concluded with the rapid rise of automation and artificial intelligence — a topic much discussed in technology circles today, especially in relation to technological unemployment. Mears also discussed the need for a more rigorous theoretical framework for big history, and this is something with which I strongly agree, and one of the things I hoped to learn by attending this conference was who is working on just this problem, and how they are going about it. This was an implicit theme in other presentations, but Mears made it fully explicit, though without giving a definitive formulation of an answer to the problem. After the initial day of presentations there was an evening reception for all involved, with many interesting conversations going on simultaneously. I was disappointed to have to miss so many presentations that sounded interesting because of the format of the conference. While a single session severely limits the number of presentations that can be made, splitting up the conference into five or six groups really fragments things. I think it would be better to keep the division to two or three concurrent sessions. My overall reflection on the first day of the conference was the ongoing division between scientific and humanistic historiography, which is precisely what big history is supposed to overcome. In the extensive discussion after the “Theories of Thresholds” presentations, the traditional historiographical question was asked — Is history a science, or does it belong to the humanities? — and, despite this being a gathering of historians, the question was not taken up in its historical context. History began as a literary genre, then it became one among the humanities, and now it is becoming a science. All of these approaches still exist side by side. There is a division among participants between those coming from a primarily science background, and those with a more traditional background in history, where “traditional” here means “humanities-based historiography. Big historians are determined to bridge these diverse backgrounds, and to emerge from the “silos” of academic specialization — but it hasn’t happened yet. On Thursday 30 July 1914 Russia announced general mobilization. The next day, on Friday 31 July 1914, Germany declared Kriegsgefahr Zustand (danger of war) while France authorized full mobilization. One hundred years ago today, on Saturday 01 August 1914, With Russia failing to respond to Germany’s ultimatum to demobilize, Germany began full mobilization and declared war on Russia. The events that had been building through the July Crisis now broke in full force, and the major powers of Europe were mobilizing and declaring war. Among the fates of emperors, nations, and millions of people, one young soldier was mobilized, Ernst Jünger, whose life was to coincide with much of the violent twentieth century. Ernst Jünger remains today a controversial figure, but also an influential figure — much like Heidegger, who read Jünger carefully and even conducted a seminar on Jünger’s work — but Jünger outlived both the First and Second World Wars in which he fought, and continued to write, leaving a substantial literary corpus. He was sufficiently rehabilitated to appear with both French and German leaders at events commemorating the First World War. His masterpiece, In Stahlgewittern, translated as Storm of Steel, was a celebration of the “frontline experience” (Fronterlebnis) in all its horror and power. The book was much revised throughout Jünger’s life and appeared in many editions; the later editions carry the simple dedication, “To the Fallen,” as Jünger came to be seen as the voice of the frontline soldier of the First World War regardless of nationality. But while Jünger’s reputation rested on his first and most powerful book, he was much more than a soldier who left a single compelling memoir. Between the wars Jünger wrote a number of provocative works — most never translated into English — and came to seen as part of the “Conservative Revolution.” Whether the phrase “Conservative Revolution” is a term of art employ to distinguish Jünger from the Nazis, and to distance him from them, or there was a real difference between Nazi writers and writers of the Conservative Revolution, remains controversial today — again, for much the same reason that Heidegger remains controversial today. Prior to the revolution of 1933 the philosopher Martin Heidegger lived in a totally unpolitical intellectual world, but maintained friendly contacts (in part through his sons) with the youth movement of the day and with certain literary spokesmen for Germany’s youth — such as Ernst Jünger — who were heralding the end of the bourgeois-capitalist age and the dawning of a new German socialism. He looked to the National Socialist revolution to bring about a spiritual renewal of German life on a national-ethnic basis, and at the same time, in common with large sections of the German intelligentsia, a healing of social differences and the salvation of Western culture from the dangers of Communism. He had no clear grasp of the parliamentary-political processes that led up to the seizure of power by the National Socialists; but he believed in the historical mission of Hitler to bring about the spiritual and intellectual transformation that he himself envisaged. In contrast, the most damning book yet written about Heidegger, Emmanuel Faye’s Heidegger: The Introduction of Nazism into Philosophy in Light of the Unpublished Seminars of 1933-1935, devotes several detailed pages to Jünger and Jünger’s influence on Heidegger. Faye’s reading of Jünger turns him into a enthusiastic Nazi, and this is not the reading usually given of Jünger’s relation to Nazism. Whether Jünger is admired or deplored, he is one of the inescapable figures of the twentieth century, and it is his relationship to global industrialized warfare that has made Jünger into a pivotal figure. Many wrote on war and their experience of war; only Jünger fully revealed the changed character of war that reflected a new form of civilization. The frontline experience that was central to Jünger’s Storm of Steel, and which was the bond of the quasi-fascist Freikorps in Germany during the inter-war period, deserves to be given an exposition as an countervailing account of the battlefield experience of the First World War. One of the most common claims made about the combat experience of the First World War was that it was exclusively an experience of terror and misery, and that this contrasted to the possible adventure, edification, glory, and personal engagement of past combat environments. According to this narrative, the industrialization of war eliminated the possibility of honorable single combat, and the men who went to war were reduced to mere widgets in the war machine. During the First World War we have tiny figures clambering over enormous guns which required crews of hundreds who operated this machinery dispassionately and without any personal connection to what they were doing, much as pilots for the first time bombed targets on the ground without seeing the lives they took. Killing became automated and impersonal. What this conventional reading fails to tell us points to a fundamental and crucial aspect of the change that came to combat with the industrialization of war. Prior to the First World War, the structure of armies was a perfect mirror of the social structure of society. Not only was there the obvious distinction between officer corps, all of them aristocrats, and the foot soldiers, drawn from the lower classes of society, but even among the officers there was a feudal hierarchy. The higher one’s family in the peerage, the higher one could rise in military ranks, and the most desired spots in the army were reserved for those with the best connections. Thus highly coveted positions like being a mounted cavalry officer were only given to the sons of the “best” families, and in pre-industrialized warfare, the cavalry charge was the “highlight” of a battle in which the greatest glory was to be won. When the First World War began, many believed it would be a replay of the Franco-Prussian war, complete with cavalry charges with swords drawn. In some places, the war did in fact start out like that, but this was not the primary experience of warfare after industrialization. The typical experience of a soldier in the Great War was to be one of many millions of men in the trenches. Most did not distinguish themselves in this uncompromising environment, but they slogged through and fought as best they could under the circumstances. The fact that the first global industrialized war was a mass war predicated upon the mobilization of millions of men — the full participation of mass society in the war — meant that millions of men were exposed to the same stimulus, and different men responded differently to this stimulus. War exercised a selective effect in combat that could never effectively come into play with the rigidly feudal armed forces of ages past. While for the vast majority of men in the trenches, the war was miserable, in addition to being an unprecedented horror, there were some few men who “found” themselves in combat, and who came to relish the excitement of trench raids and risking their lives. In Maslovian terms, for some men, war is a peak experience. It certainly seemed to have been so for Junger. It is often asserted that the last form of the personal duel in industrialized warfare was the experience of fighter pilots in dogfights — and, curiously, we sometimes read this side-by-side with the claim that air warfare is dehumanizing, impersonal, and technical. Everyone has heard of the Red Baron, and many have heard of the great aviation aces of the Second World War, but “aces” emerged in all forms of combat — in tanks, in submarines, and among frontline soldiers. These were men who intuitively mastered the new technologies and took to them as if by instinct. The personal duel, and the sense of honor intrinsic to this form of combat, lived on in global industrialized war, but it became a marginal experience, an outlier in the midst of the millions of men who went to war and who were in no sense suited for killing. In comparison to the many millions who fought and died and had no taste for war, the few who took to modern industrialized warefare represent only a very small fraction of the total. The distinctive Fronterlebnis, and those who flourished in this violent atmosphere, was not the typical experience of war, but it was new experience of war emergent from the changed social conditions under which the war was fought, and Jünger was its prophet.